A Nightmare on Elm Street 5: The Dream Child is a 1989 American slasher film and the fifth installment in the Nightmare on Elm Street series. It was directed by Stephen Hopkins and stars Robert Englund, Lisa Wilcox and Danny Hassel. 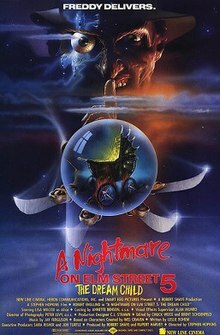 It is the sequel to A Nightmare on Elm Street 4: The Dream Master and is followed by Freddy's Dead: The Final Nightmare. The film's general tone is much darker and the dream sequences are more Gothic than the previous films of the series. A blue filter lighting technique is used in most of the scenes. The film's main titles omit the numeral 5, which was used in all of the promotional material, television advertisements, trailers, and merchandise; simply showing the title A Nightmare on Elm Street: The Dream Child. Released on August 11, 1989, it is one of the final slasher films released in the 1980s. It grossed over $22 million at the domestic box office and received a generally unfavorable critical reception. In June 1989, a year after the previous film, Alice and Dan have started dating and there is no sign of Freddy Krueger. One day, in the shower, she has a vision of herself dressed in a nun's habit with a name-tag saying Amanda Krueger at a strange asylum. She is attacked by patients at the hospital but wakes up. The next day, Alice is graduating from high school alongside her new friends Greta, an aspiring but reluctant, supermodel; Mark, a comic book fan; and Yvonne, a hospital volunteer and swimmer. Alice confides her nightmare to Dan, who tells her she is in control of her dreams. On her way to work, Alice finds herself back at the asylum, where she sees Amanda giving birth to a gruesomely deformed baby. Amanda tries to collect the baby before it escapes but it sneaks out of the operating room. Alice follows the baby into the church where she defeated Freddy in the previous film. The baby finds Freddy's remains and quickly grows into an adult, hinting to Alice that he has found the key to coming back. Alarmed, she contacts Dan, who falls asleep en route to see her. Freddy attacks and electrocutes Dan, turning him into a frightful creature before veering him into oncoming traffic. Alice sees Dan's body come to life and taunt her before she faints. Waking in a hospital, she hears the news of Dan's death and that she is pregnant with his child. In the night, she is visited by a young boy named Jacob but the next day, Yvonne tells her there are no children on her floor, nor is there a children's ward. Alice tells her friends about Freddy and his lineage; Yvonne refuses to listen but Mark and Greta are more supportive. That afternoon at a dinner party at her home, Greta falls asleep at the table. She dreams of herself snapping at her mother and ranting over her controlling nature before Freddy arrives and forces Greta to eat herself alive before choking her in front of a laughing audience. In the real world, Greta falls down dead in front of her mother and their guests. Yvonne and Alice visit Mark, who is grieving Greta's death, and a rift forms between them. Mark falls asleep and is nearly killed by Freddy but Alice saves him before seeing Jacob again. Jacob hints that she is his mother. Alice requests that Yvonne gets her an early ultrasound and discovers Freddy is feeding Jacob his victims to make him like himself. Yvonne and Dan's parents still believe Alice is crazy. Dan's parents insist that she give them the baby when it is born, which Alice refuses. Alice and Mark research Krueger and the Nun Amanda. Realizing Amanda was trying to stop Freddy, they investigate her whereabouts and Alice goes to sleep, hoping to find Amanda at the asylum. While there, Freddy lures her away by threatening Yvonne, who has fallen asleep in a jacuzzi. Alice rescues Yvonne who finally believes her. Mark falls asleep and is pulled into a comic book world, where Freddy slashes him apart. Alice goes to bed to find Freddy and save her son. She is led into a maze before she draws Freddy out from within herself. Yvonne finds Amanda's remains at the asylum and joins the fight in the dream world, encouraging Jacob to use the power Freddy had been giving him. Jacob destroys Freddy and his infant form is absorbed by his mother while Alice picks up a baby Jacob. Warning Alice away, Amanda seals Freddy away in time. Several months later, Jacob Daniel Johnson is enjoying a picnic with his mother, grandfather, and Yvonne. Some children jumping rope nearby are humming Freddy's rhyme. A Nightmare on Elm Street 5: The Dream Child was released on August 11, 1989, in 1,902 theaters in North America. On the first weekend, the film grossed $8,115,176, falling behind Parenthood ($9,672,350) and James Cameron’s The Abyss ($9,319,797). The film ranked eighth at the second-weekend box office, with a revenue of $3,584,320, and it dropped out of the Top 10 list ranked at eleventh and fourteenth on the third and the fourth weekends, respectively. Overall, the film grossed $22,168,359 at U.S. box office; it is the second-lowest-grossing Nightmare on Elm Street film. The film ranked number forty-three of the Top fifty highest-grossing films released in the U.S. in 1989 and is thirty-seventh of all slasher films cataloged by Box Office Mojo. A Nightmare on Elm Street 5: The Dream Child received mostly negative reviews from critics. The review aggregator website Rotten Tomatoes reported a 32% approval rating and an average rating of 4.2/10 based on 31 reviews. Variety called it "a poorly constructed special effects showcase" with "highly variable" acting. Caryn James of The New York Times wrote that the film "doesn't pretend to be anything more than it is – a genre film that won't totally insult your intelligence or your eyes". Kevin Thomas of the Los Angeles Times described it as "a dynamic, fully visually realized experience", complimenting the acting, set design, and directing. Thomas identifies Krueger as representing the irrational adult world to teenagers. Richard Harrington of The Washington Post ranked it below the first and third films, saying the plot is too confusing. Director Stephen Hopkins has expressed disappointment with the final product, stating that "It was a rushed schedule without a reasonable budget and after I finished it, New Line and the MPAA came in and cut the guts out of it completely. What started out as an OK film with a few good bits turned into a total embarrassment. I can't even watch it anymore." Several scenes were removed from the film's final cut. The graduation sequence, which showed Alice's father giving her the camera, was significantly reduced. As a result, there are a number of minor continuity errors such as Alice holding airplane tickets moments before Dan gives them to her as a surprise gift. Upon its release, the movie was subjected to some cuts in the sequences of Dan's, Mark's and Greta's deaths to avoid being classified X by MPAA due to their extremely violent and graphic nature. An unrated version of the film, which contained longer, more graphic versions of Dan's, Greta's and Mark's death scenes, was originally released on VHS and Laserdisc formats. In Dan's scene, cables can be seen sliding under the skin of Dan's arm, a large piece of the bike pierces his leg, and the skin on Dan's head is much more graphically torn off while he screams in pain. In Greta's scene, Freddy slices open a doll that begins to bleed and Greta is shown to have a gaping wound in her stomach, from which Freddy starts to feed to her. In Australia, the scenes were cut in cinemas, but restored to the VHS release. In Mark's death sequence, Freddy turns him into paper and shreds him before beheading him; the decapitation scene was deleted from the original version of the film. Despite this, the Australian Classification board did not rate it "R18+", giving it the lower "M15+" rating. As of 2018, New Line Cinema has yet to officially release the uncut version of the film on DVD but excerpts of these scenes are found in the Nightmare 5 section of the documentary Never Sleep Again: The Elm Street Legacy. The soundtrack album consists of ten tracks. The first side consisted of heavy metal and hard rock songs, while the second consisted primarily of hip hop songs. Bruce Dickinson, lead singer of heavy metal band Iron Maiden, wrote and performed the song "Bring Your Daughter... to the Slaughter" for the film. A second version of the song recorded with Iron Maiden became the band's only Number 1 single in their native UK when released in December 1990. All tracks written by Jay Fergusonn. ^ Fujishima, Kenji (2016-01-14). "Revisiting all 8 of Freddy's nightmares, the richest of the slasher franchises". The A.V. Club. Retrieved 2017-04-01. ^ "August 11-13, 1989 Weekend". Box Office Mojo. Retrieved May 10, 2011. ^ "A Nightmare on Elm Street 5: The Dream Child". Box Office Mojo. Retrieved June 5, 2016. ^ "A Nightmare on Elm Street 5 - The Dream Child (1989)". Rotten Tomatoes. Retrieved June 5, 2016. ^ "Review: 'A Nightmare on Elm Street: The Dream Child'". Variety. 1989. Retrieved June 5, 2016. ^ James, Caryn. "Review/Film; Dreams and Nightmares On a Well-Traveled Street". Rotten Tomatoes. Retrieved 2016-06-05. ^ Thomas, Kevin (August 11, 1989). "Movie Review : Dreamy Confrontation in Freddy's Family". Los Angeles Times. Retrieved June 5, 2016. ^ Harrington, Richard (August 12, 1989). "'A Nightmare on Elm Street 5: The Dream Child'". The Washington Post. Retrieved June 5, 2016. ^ Shapiro, Marc (December 1990). "Predator 2 Stalks the Concrete Jungle". Fangoria (99): 36–40, 64. ^ "Photographic image of DVD cover" (JPG). Nightmareonelemstreetfilms.com. Retrieved 2016-09-28. ^ "Nightmare on Elm Street 5: The Dream Child - Original Soundtrack". AllMusic. Retrieved June 15, 2015. ^ "A Nightmare On Elm Street - 8 CD Box Set". Varèse Sarabande. Retrieved 26 January 2019. This page was last edited on 17 April 2019, at 10:57 (UTC).